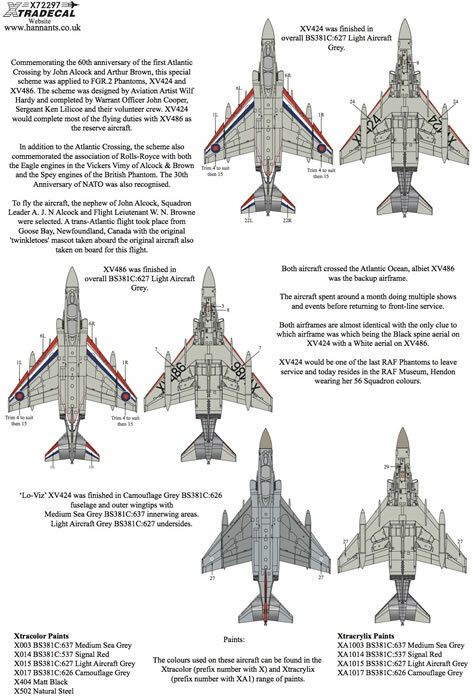 High quality decals; full colour instructions; includes national markings and serials; interesting markings. A high quality decal release for the forthcoming 1/72 scale Phantom FGR.2 kit. 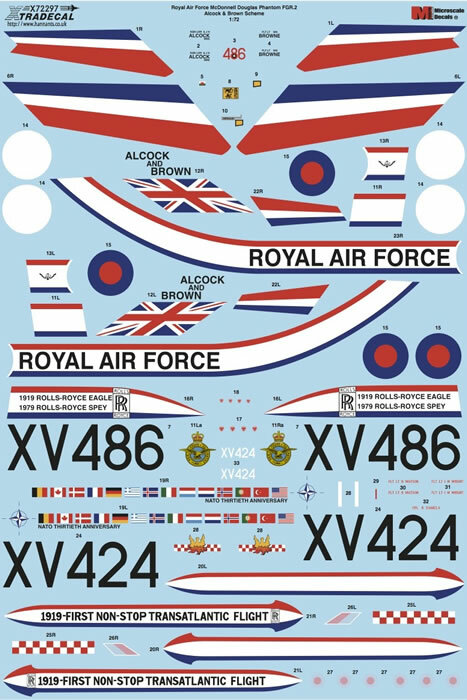 Xtradecal has released another new 1/72 scale decal set with several options for the forthcoming Airfix FGR.2 kits. This latest offering covers the colourful and unique commemorative Alcock & Brown markings. These special markings commerorated the 60th Anniversary of the first Atlantic Crossing by Alcock and Brown. 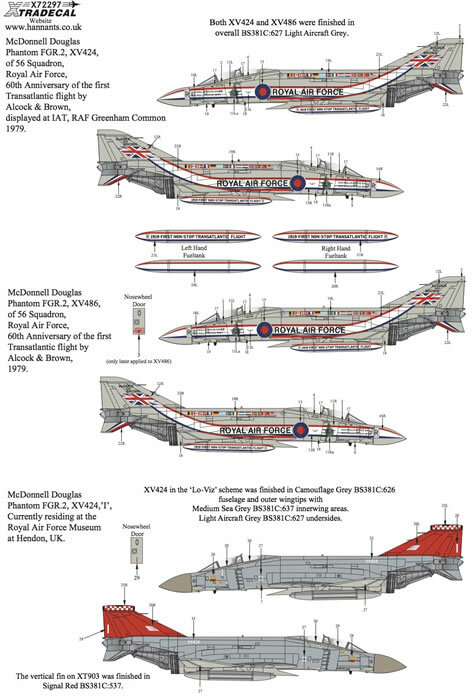 The Xtradecal set includes XV424 as displayed at IAT Greenham Common 1979 and XV486 the back up aircraft. XV424 is currently displayed at the RAF Museum at Hendon in 56 Sqn markings and these are also included. Instructions for the decal sheet are in full colour across one folded double-sided A4 and one A5 sheets. 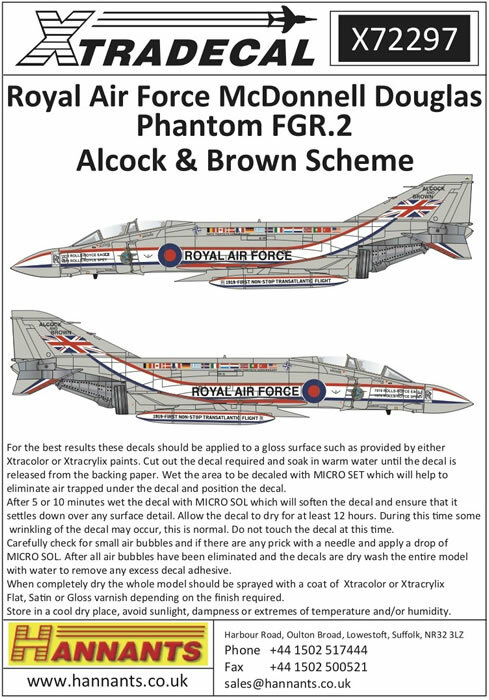 This release offers a high quality set of colourful options for the forthcoming 1/72 scale Phantom FGR.2 kit.